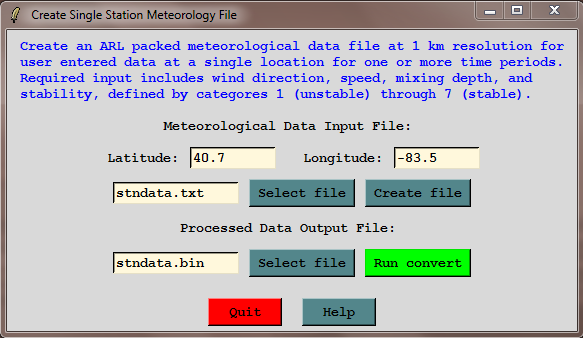 Meteorological data files are available from a variety of sources. However, most will need to be reformatted for use by HYSPLIT. 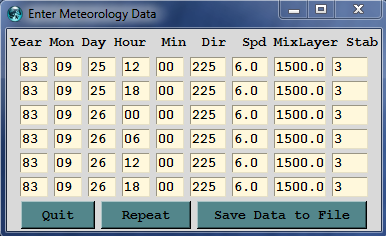 The Meteorology / Convert to ARL menu tab provides several options. The User entered menu permits the user to manually enter one observation point but for several time periods to create a spatially homogeneous custom meteorological file (PC and UNIX) at 10 km resolution covering a 250 by 250 km domain. First select the user entered menu tab to open the menu to set the grid center which should be 40.7N 83.5W. The grid center is set slightly northeast of the release location because of the wind direction. If the stndata.txt file does not already exist (it doesn't), then select Create File. 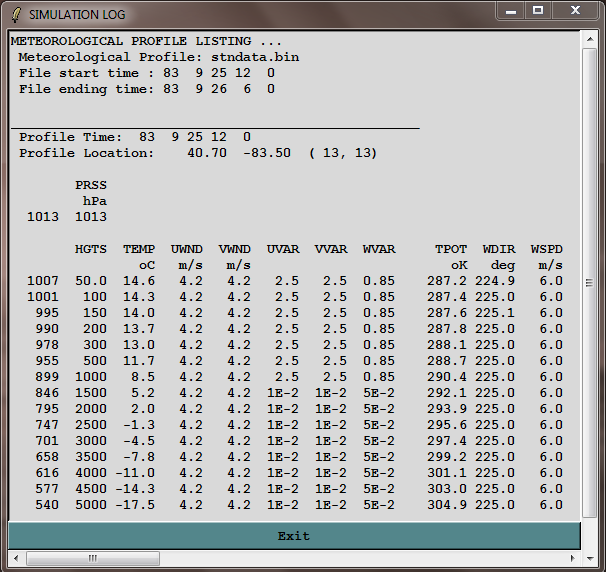 The meteorology enter data menu provides one line for each time period. Enter the information on the first line, replacing the current clock time with 83 09 25 12 00, set the wind direction and speed to 225 at 6.0 m/s with a mixed layer depth of 1500 m and stability category 3. Then use the Repeat button to fill the remaining values of the table. For each subsequent line change only the day and time at 6 hour intervals (25 12Z; 25 18Z; 26 00Z; 26 06Z; 26 12Z; 26 18Z). 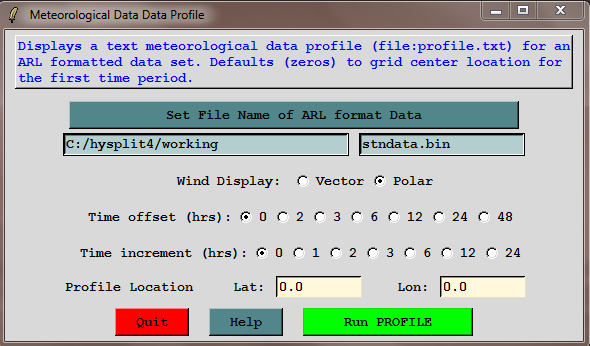 Then Save Data to File and Run Convert which will then create the binary meteorological file stndata.bin in the \working directory for use by HYSPLIT. Open the profile menu and select the stndata.bin file. No other changes are necessary to see the sounding at the first time period. The other time periods will all be the same. The wind direction and speed have been converted to vector components at all levels and velocity variances correspond to values that will give plume growth similar to stability category 3 (also known as "C") at all levels below the mixed layer depth. Normally meteorological data at a single location and valid at only one height should not be used for complex trajectory or dispersion simulations. However, this approach may be ideal when trying to produce results to match other scenarios such as exercises where the wind direction and speeds are prescribed for an incident.